This article is an exploration into the essence of what a "Ngangulero (a)" is within our Munanso. In beginning to look at this very important topic, we must first dispel some common misconceptions and shed light onto some contemporary practices within Palo here in the Diaspora. Some individuals have incorrectly described Palo as "the dark side of Santeria". This is misleading on two levels. The first is that it misleads the reader or listener into thinking that Palo is a branch of Santeria. We must clarify that Palo arose through the process of slavery which brought people of the Bantu (Kongo) regions of Africa to the Caribbean where those people exchanged spiritual tools and practices with the Indigenous Taino people and under conditions of a need for Survival and Justice, Palo arose, with its multiple branches, or ranas. 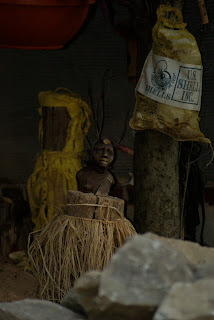 Santeria derives again through a process of slavery, and a process of synchronization with Catholic deities, but stems from the Yoruba People of Africa. It is necessary to note that Palo has incorporated aspects of all the various people of Africa with whom its practitioners interrelated once in the Caribbean. Palo is quick to apply what is proven to work, regardless of its source, however Palo is not a subset or "side" of Santeria. 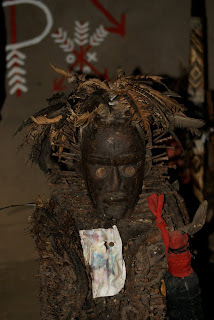 In short Santeria has roots in Yoruba land (East Africa), Palo has roots in Kongo. Second, this statement that "Palo is the dark side of Santeria" also leads the reader or listener to believe that Palo is a "dark" practice, which in the semantics of the writer means that Palo works with "bad (evil) or lower" spirits and energies. This is again misleading as it creates the idea that Palo is for "bad", for gangsterism, and for manipulation for personal gain without consideration for justice. This misconception is also further exacerbated by the rare instances when Palo is depicted through the media. We also need to acknowledge and understand that indeed there are instances where Palo is used for purely negative work, just as Santeria is, and the many other Caribbean traditions, this is derived out of the very conditions of survival that lead to the development of Palo in the first place. However Palo itself is not a tradition rooted in malevolency and negativity. A short note on the term "dark": In our Munanso we avoid utilizing the term "dark" to mean negative or evil in order not to ignorantly contribute to the historic racism that equates dark (black) with evil. We consider "dark" to be the "darkness of the Essence of the Womb of Creation", the power that generates all life. Therefore "Dark" is Divine! 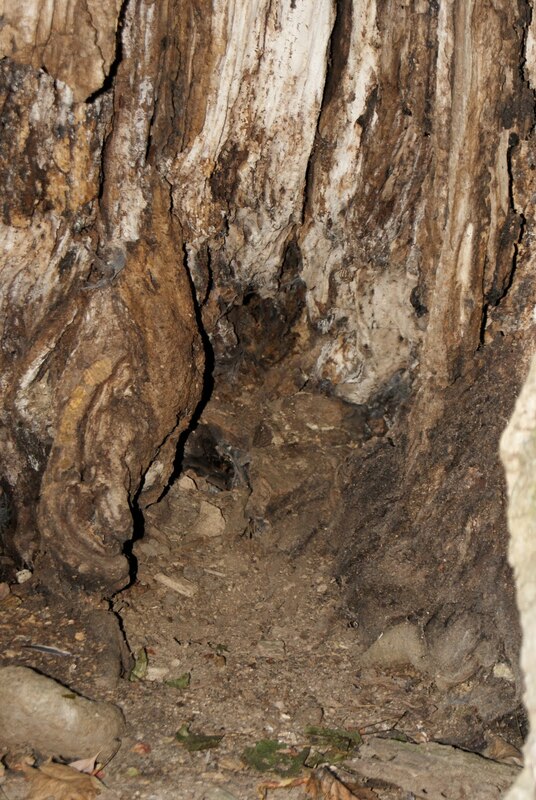 To gain more understanding, we must retrace the trail of Palo and look at the root. 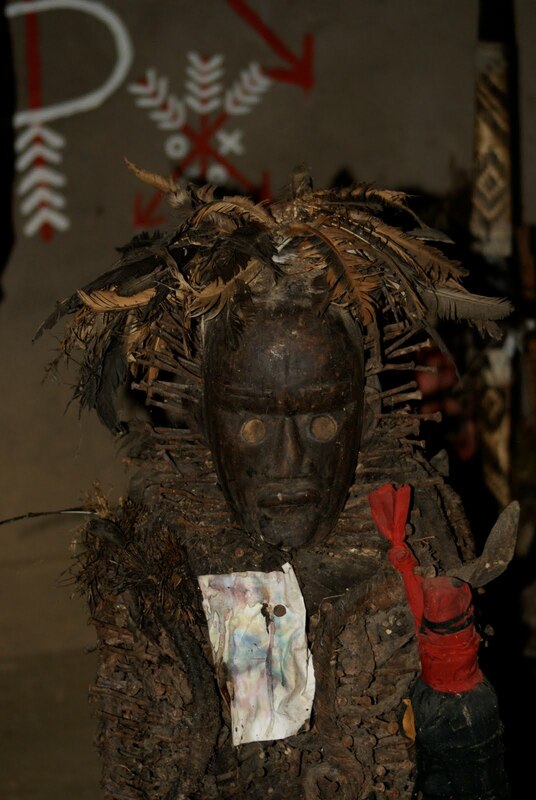 This Nkisi pictured above has two faces and is an Nkisi associated with Justice. As an example of this contradiction we face in today's practices of Palo, we can look at this Nkisi, who was created and actively worked with in Africa. The essence of the Misterio that the Nksis represents is "Divine Justice" which we can trace to the root of Elders within the community being the judges in dealing with issues and conflicts within the community. They have the ability to look at all sides of the issue, without prejudice and with a view of the overall balance and stability of the community. Their wisdom in judgement is nourished by the Ancestors directly. However in the vibration of today, we see situations where justice is absent. We also see situations where manipulations are occurring that seek not to bring balance or harmony but to disempower, corrupt and entrap. Palo is a tradition that is derived from Cultures whose sustainability and thriving rested upon healthy communities. Therefore decisions that were made and Spiritual practices were rooted in these principles. 500 years of slavery, oppression and colonization have put tremendous pressure on the practices, at certain points, not excluding the present, Palo has been outlawed, misrepresented and belittled as well as feared. We also cannot ignore the internal racism within the Caribbean which has historically segregated those societies and segregated the various Spiritual traditions. Even today we see the behavior from those practicing one tradition "looking down" on those practicing another. Misconceptions such as Lucumi being higher than Palo, or of Lucumi being higher than Taino have interfered with knowledge and understanding. Historical facts can allow us to understand that traditions that stem from three totally different physical locations and from three distinct cultures cannot be higher or lower than each other, you can only have higher or lower positions within one spiritual tradition. Then of course you have historical battles between practitioners of the various traditions but the outcome of these battles only tell us of the abilities of the individuals involved in the "battle" and not of the absolute power of the tradition itself! In our Munanso we do not subscribe to these concepts of "higher and lower" in terms of Caribbean traditions and we do not perceive Palo to be "higher or lower" than any other. We do recognize that the "Elders" within the Caribbean are the Taino who had been working with the unique Misterios of the Caribbean for thousands of years. We also recognize that "Taino" is not a monoculture but a terminology now used to describe the variety of expressions that made their home in the Caribbean. Having said this, we recognize Africa as the birthplace of humanity and the birthplace of Culture! We also acknowledge the wealth of evidence indicating pre-Columbian African influences in the Caribbean, Central and South America! 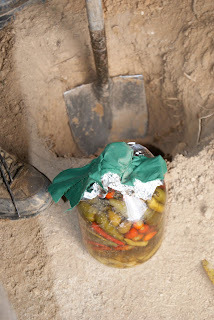 Again, we are not sharing this as "authorities" saying this is the way it should be everywhere or that anybody needs to agree with our viewpoints, we are sharing this as a contribution to clearing up misleading conceptions of Palo and to define from our Munanso our understanding of what it is to be a practitioner of Palo! 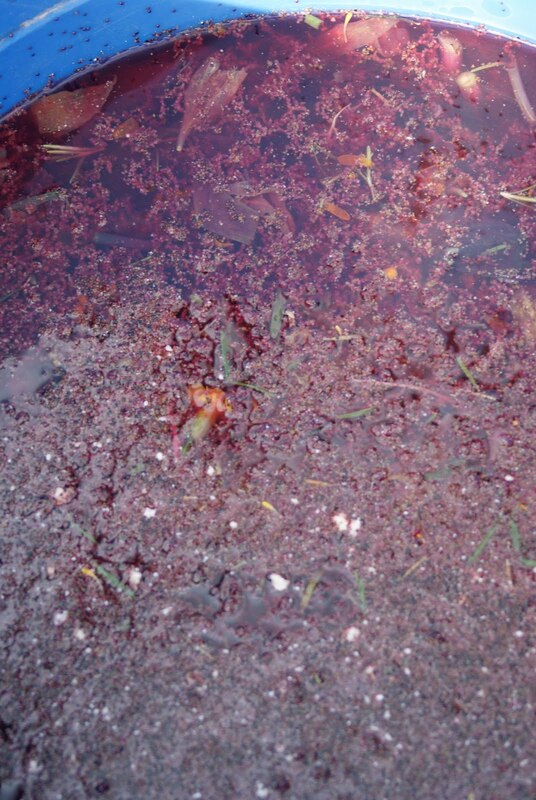 The image above is a firma, the image below is the explosion of Fula used within the Firma. This embodies only one aspect of Palo. In this case energies and Misterios are invoked to bring Justice to a situation in life which is lacking justice. This is also used to remove negativity from a situation or person. In this practice we look closely at the energy of the explosion, the direction the smoke travels in, any manifestations we see within the smoke, and helped by the camera we can look at the explosion itself to see what manifests within it. Every aspect of the process is a living, moving, documentation of what is being addressed Spiritually and Physically! For the Ngangulero this is a constantly evolving practice, bringing new insights and knowledge every time it is done. The Palero works with the Raw Elements primarily, the Tradition is firmly rooted in the Natural Environment. In today's world there is an attempt to contain the natural environment and to make the cities, towns, villages, malls, homes, etc. look as unnatural as possible. While we recognize that even these "unnatural" structures and inventions are made from raw elements and still speak to us symbolically of Spirit and Energy, we are dedicated to a process of reclaiming the "Natural Resource" and the process of refining that. This process involves transforming certain processes to bring them back to the natural elements in a more "pure" or unrefined way. Our Ancestors in the Caribbean (and worldwide) did not have electric stoves, coffee makers, microwaves, rustoleum paint, fast set cement, parafin candles (laced with lead), concrete floors, store bought adobo seasoning (laced with chemicals), and the list goes on. Our Munanso has undergone an evolutionary process of step by step, year by year, discarding these (chemically and energetically) "tainted" materials and reverting to (within our ability to do so) more of the "rawness" within the practices. Above you can see the Okra, Onion, Pepper, Jalopena pepper, palm oil mixture that is frequently used for the Fundamento, being cooked over an open fire in a cast iron pot. From a Spiritual perspective rather than use electrical or gas fire to cook, we are using multiple Palos (trees) most of which naturally died or are branches that died on a living tree, that house all manner of living things such as ants, other bugs etc, and who have recorded the story of what they have witnessed and the cyclical seasons of abundance and drought, their very material derives from the soil nutrients and sun energy. 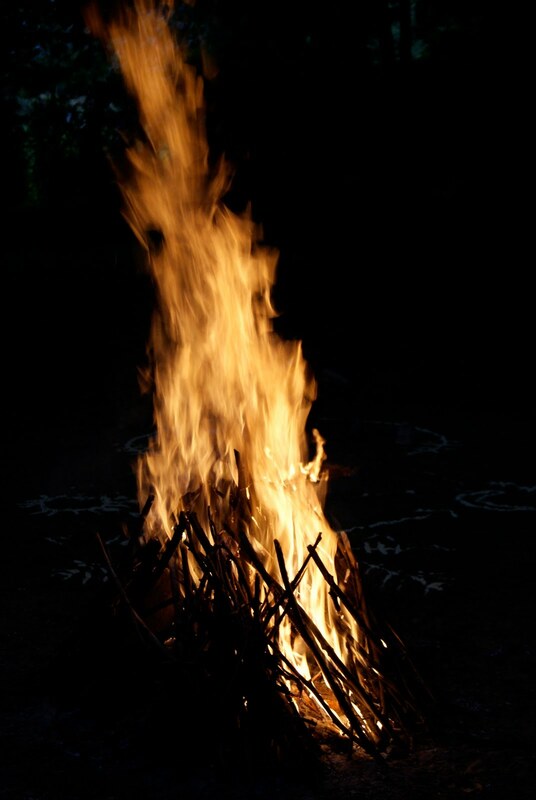 All this natural Spirit is being incorporated into the Okra mixture, additionally the gusts of Wind that come by, the Rays of the Sun (or Moon if at night), any leaves or bugs that fall from the trees above, plus the Energy emanating from the Earth herself below the fire. Later we gather up the ash for use within the Munanso and for use in adding fertility to the gardens! 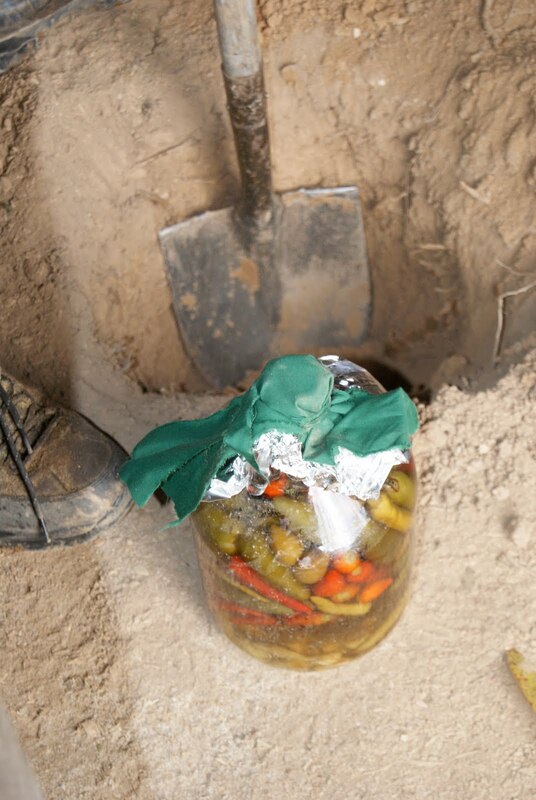 Even the iron pot (chemical free) adds energy to the Okra mix. It is a fact that food (and coffee) cooked over fire on the grill outside tastes better than the exact same food cooked on electric or gas inside. Spiritually they are miles apart. Plants (Trees, Shrubs, Perennials, and Tropicals) are all vital within the Munanso. Over the years many of the plantas that we have used came from Botanicas, and we are certainly appreciative that fresh herbs are available today, even via the internet! 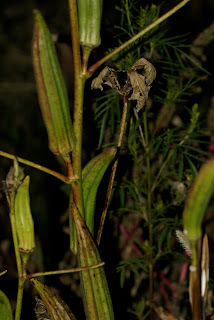 However, not only are these plants expensive, it is also very difficult to get them in a timely manner if one does not live near a reliable Botanica, because online orders can come within a couple days or a couple weeks, so timing is difficult, and also Botanicas can run out of plantas. Furthermore, it is always dangerous when one comes to rely strictly on one source of materials, especially the plant materials which are so vital to our Spiritual practices. The continued source of fresh plants is not guaranteed and could become problematic in the future. Several years ago it became a priority within the Munanso to begin to gather medicinal plants that could be used for the needs of the Munanso. 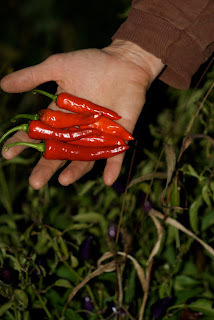 Some of these thrive in our temperate climate, although they are unavailable fresh for about 3 months in the winter. 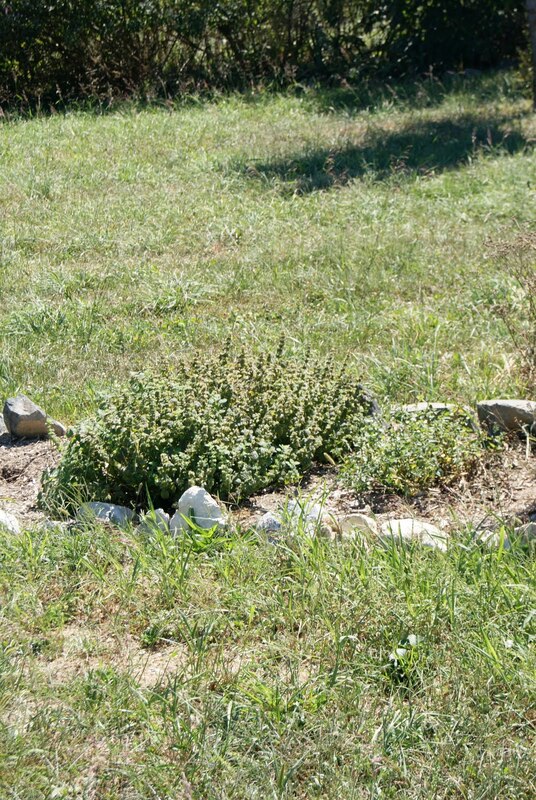 Plants like Oregano, Mint, Lavender, Sage, Osha, Chamomile and many others grow perennially here, coming back year after year. Other medicinals such as Mullein, Chicory, Plantain, Dandelion, Cedar, and many more grow wild. Others such as the white sage and tobacco get planted each year, however the tobacco also becomes a wild plant because its seeds find fertile soil and Tobacco seedlings spring up again the following year. As many Nganguleras are aware, tropical bano plants can be propagated from the stems or seeds that come from fresh plantas from the Botanica. The simplest one to grow is of course "Yerba Bruha" (Life Everlasting) which is one of the most commonly used plantas that the Palero deals with! Over the years we have slowly propagated and acquired various tropical plants which we bring outside during the summer and laboriously bring inside during the winter. This has not only enhanced the Munanso from a practical point of view but it is also a way of bringing the living Spirits of those plants "home" to the Munanso. It is important to the various Misterios and Ancestors that those plants are here. 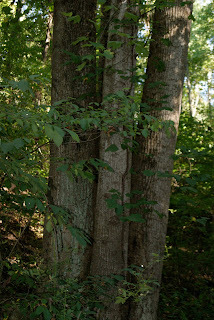 We also make a point of planting Native Medicinals both in the Munanso and around the Ceremonial Grounds, such as Ginseng, Black Cohosh, Soliman's Seal, Native Psychic, Cup Plant, and many more. We use the terms "Ngangulero" and "Ngangulera" interchangably" in this article. There is an undeniable behavior of "machismo" within the expression of some Munansos here in Turtle Island and within some Munansos women are given limited roles and are not able to do many things. In our research this Machismo behavior is derived from Colonization and is not innate within the Roots of the Tradition. In our Munanso there is of course certain things that only women have the power to do, and there are certain things that only men do at this point. Beyond this we do not subscribe to the concept that women cannot actively work with Fundamento, Divination, and the making of "Medicine" as well as "travajos". We know that there are MANY Munansos that do not disempower that which empowers any Munanso, which is the power of Yayi! 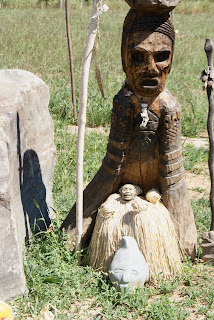 These images are images of the "Women's Munanso" within the Munanso! This developed over time as the number of Feminine Misterios and their Fundamentos and Bilongos increased to the point where they needed their own, fairly large space! This does not mean that the Bilongos in this Munanso are only female, it means that a Yayi is the Ngangulera of this space! This is one of the Bilongos of the Women's Munanso, representing our Earth Mother, who gives all Fertility and Abundance to life! Bundles of herbs are gathered for Spiritual purposes. 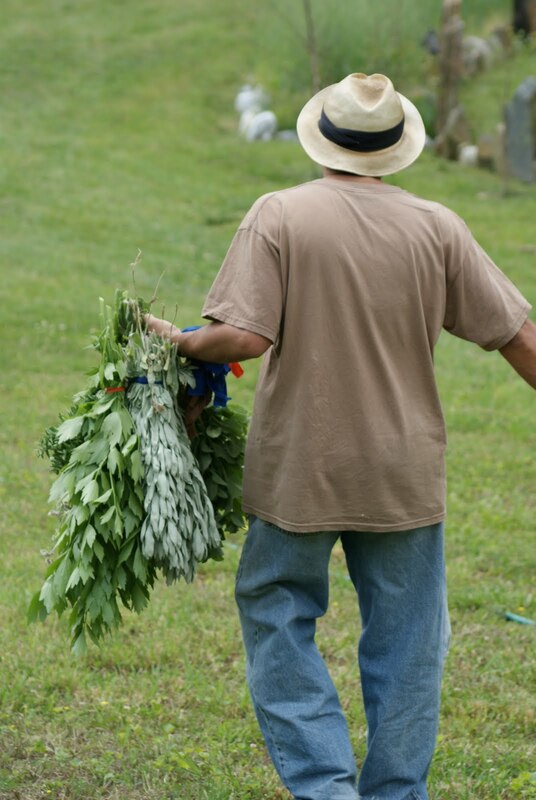 Sometimes this takes quite a while as we need to go all over the Ceremonial Grounds and even into the forest seeking out the herbs which grow both in gardens and wild! Our area of the country is naturally forested, however the bulk of land here is deforested due to farming and construction. People are very attached to their lawns and farmers are very attached to mechanized and chemicalized agricultural practices. 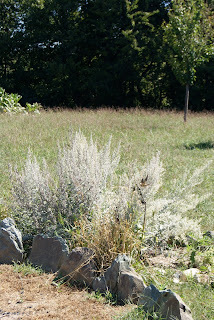 Although we do have open space in the Ceremonial Grounds (because it was a hay field at one time) we have made it a priority to plant many trees, including many, many Native trees, and to transform our gardening practices to create what is termed permaculture, which seeks not to disturb the soil and seeks to recreate the balance between Forest and Food needs. Within the forest many medicinals and food plants can be grown! As Paleros we are also seeking to bring a positive contribution to the ecological balance of the Land that we are blessed by the Ancestors of the Munanso to be caretakers of! "Somos o No Somos?" This phrase is a question we ask ourselves and we ask the Misterios which embodies much more than its literal translation into english "Are we or Are we Not?" It is an expression that goes to the core of our essence as Nganguleros, it asks the fundamental question of "what it is that we are accomplishing?" "What do we have to show for all our effort and sacrifice?" "What have we manifested? ""How powerful is our Medicine?" As we also say "the taste is in the pudding", meaning you know the power of the Medicine from its results, you know the power of the Ngangulera from her results! Unfortunately due to inferiority complexes, jealousy or laziness, there are many that seek to diminish the results that others are able to achieve. Because of this they do not acknowledge the combination of the Spirit of the Ancestors and the skill and dedication of the Ngangulero that has lead to the achievement and manifestation of something beautiful. These folks are only fooling themselves and nailing themselves to further stagnation, jealousy and complexes. It is through the creative relationship between Palero and Misterio that a beautiful Munanso with abundant resources manifests and continues to expand its manifestation! It is from the blessing of the Ancestral Spirit and Mpungo as well as from the blessing of the heart and Spirit of the Ngangulero himself and Ngangulera herself! To diminish this is only to diminish one's understanding, wisdom and will power! 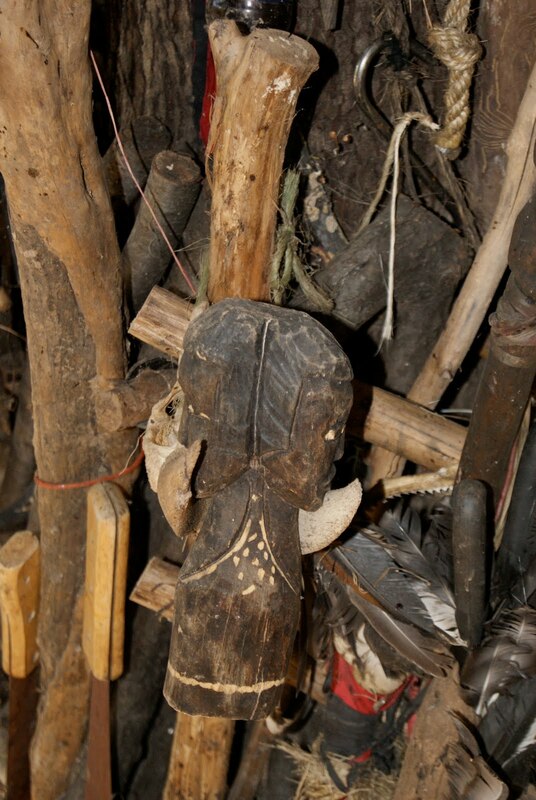 This old Kongo ancestral pipe found its way into our Munanso. This is a pipe depicting a Powerful Female Ancestor and is currently used by the Yayi of the Munanso for Spiritual purposes. For us it came at a critical point within a critical cycle and came as a confirmation of the role of Ngangulera being equally as important and valid as role of Ngangulero! In "her" arrival we hear the voice of the Ancestral Bakongo Spirit speaking directly to us and contributing in a powerful and uplifting way to the movement of our Munanso! In the center of the Munanso is a Ceremonial tree with 360 degrees of working space. 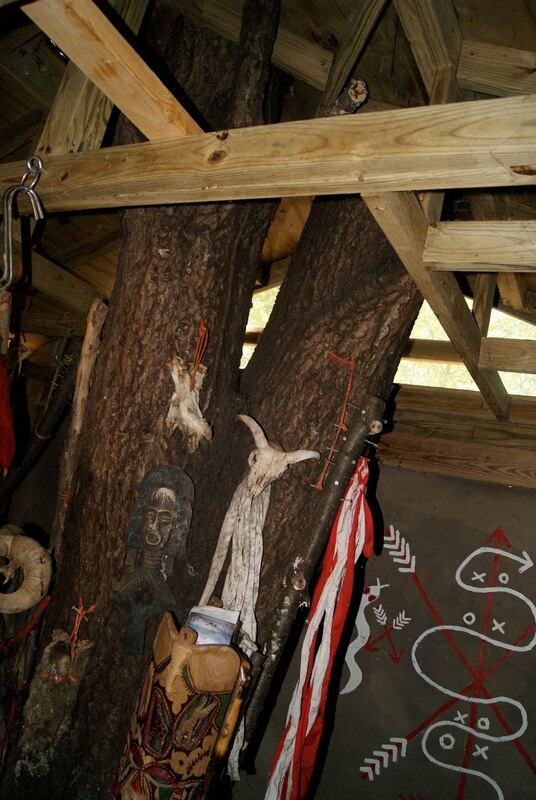 There is a particular direction on the tree dedicated to working with the energies of Zarabanda. 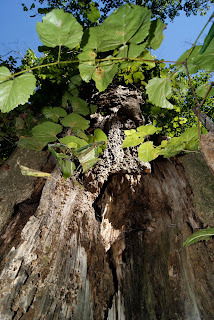 This tree is not exclusive to any individual Mpungo, it embraces all, and the elements on the tree represent many different Misterios, including elements indigenous to this area and North! Palo is an adaptable tradition derived from a historical process that demanded adaptation to the changing situation that Paleros found themselves in. Today we face global situations that are demanding that we adapt, and adapt fast. We do not know if the adaptation that is being demanded by Mother Earth herself will occur fast enough for there to be "future" in any terms that we are used to, however in the Munanso we extend ourselves to prepare and implement the adaptations that are necessary. One basic adaptation that is necessary is to embrace the Natural Spirits that have traditionally lived here, which includes all the animal and plant Spirits that live here or have lived here. Bakongo practitioners did this upon coming into the Caribbean and adapted to the animals and plants found in the Caribbean very quickly through absorbing Taino wisdom and knowledge concerning these things. It is not the first time, nor the last. 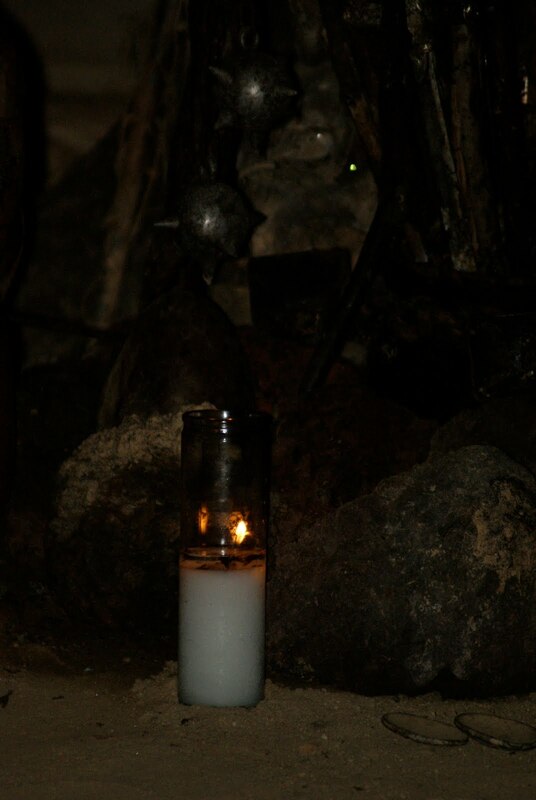 Here a candle burns in front of the Lava stones that surround Nsasi. Some of these Lava stones have been used in the purification (sweat) lodge and are now with Nsasi, so beyond the energy they received through their creation from the depths of the Volcano, they also have the energy of the purification lodge embodied within them, which is of course a tradition from Turtle Island! 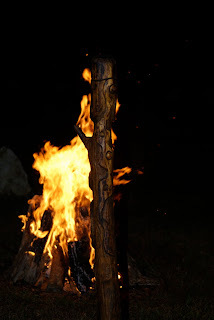 The photos above show a glimpse of just one aspect of the creation of this Ancestral Baton. This Ancestral Baton was created from a Palo that came from the Ceremonial Land itself and was manifested through a working together of the Ngangulero and Ngangulera of the Munanso. The tools used to carve the Baton were ceremonially prepared (fed) and the whole process was done in a ceremonial way! Various layers of ingredients were absorbed into the Baton to create one of the masterpieces of this Munanso! The Rays of the Full Moon (Sun light reflecting off the Moon to the Earth) bathed the Baton with the power of Feminine and Masculine working in Harmony and Balance together! 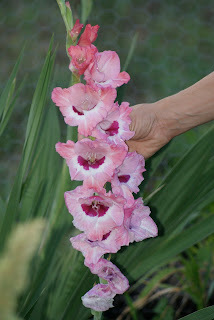 Here are glimpses of the abundance of the gardens. We take a lot of pride and get a lot of satisfaction from the fact that we grow many of the ingredients that we use in the Munanso! Here are peppers, Okra, and Chamba! 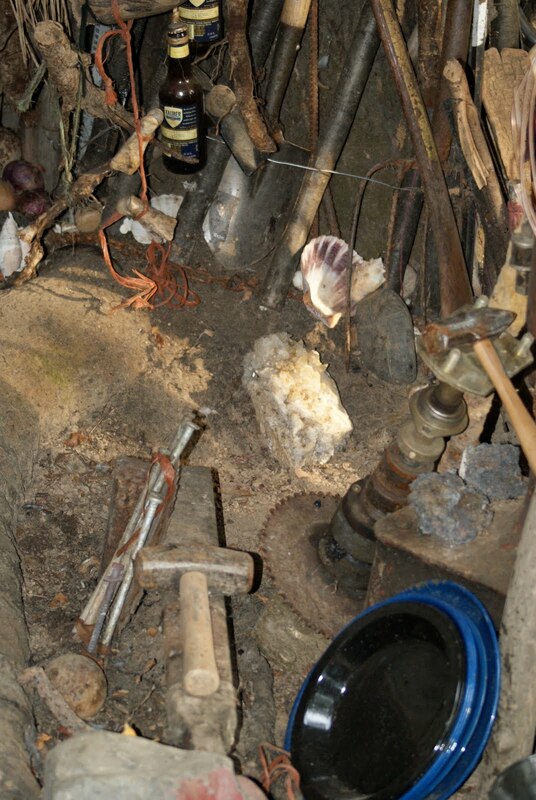 The image below is of the women's Munanso before it outgrew its space and moved into a larger house! Everything gathers energy over time, what begins small grows as Misterio gathers and energy amplifies. Without the small, the large is never possible. 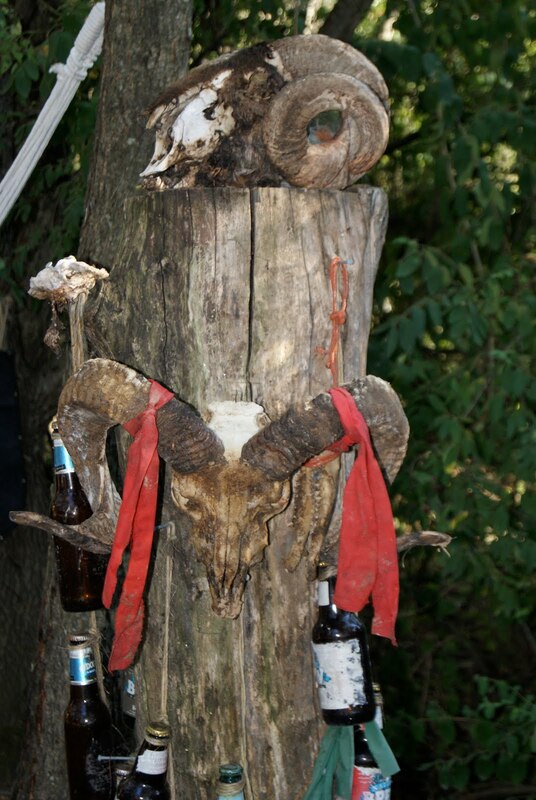 The wooden stool is also carved from a tree stump from the Land! The two photos below show a Bano made from herbs from the land, you can clearly see three Yerba Bruja leaves that came from our propagated plantas! This was a "sweet Bano", that also included the magenta Amaranth, which is the amaranth used in Mexico for "Day of the Dead" and which also is a Power Grain! 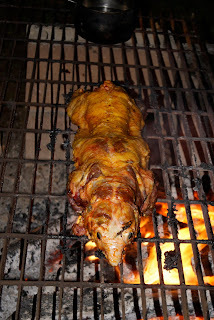 Again we return to the outside grill, this also provides plenty of space to cook ground hog, which is later ground up and used with catfish, roasted corn, etc. Ground hog is native to this area and very abundant. It is very appreciated by Lucero Mundo! Ground hog appears obese, but is very muscular due to the tremendous strength it needs to burrow. Under difficult situations we could eat the ground hog ourselves and some people actively seek out ground hog as a delicacy! However, ground hog is very difficult to handle and poses a challenge for the Tata! This is a feast which we do for the Ancestors on the "Day of the Dead". 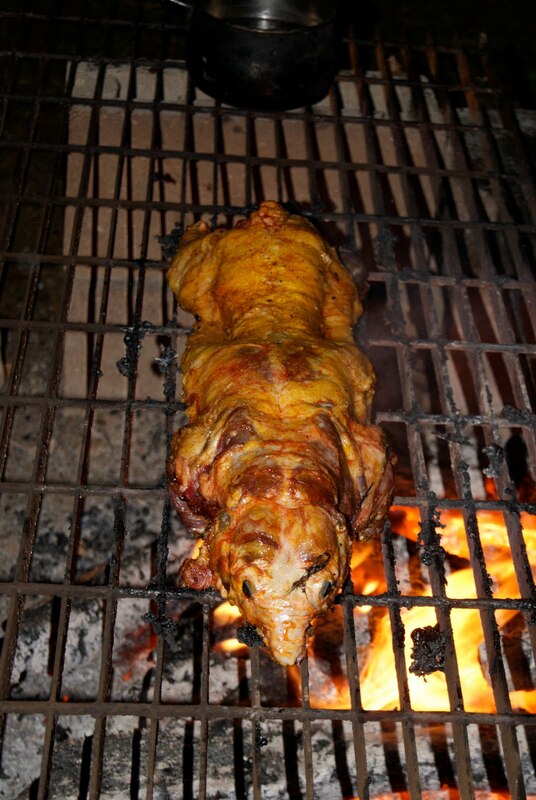 It includes a pig head with Roots, Onions, Peppers, Roasted Corn and Smoke Fish, as well as green bananas and eggplant and Bacalao (dried Codfish). There is also an abundant offering of fruits and vegetables all around the central tree! This bear lives indoors but is included here as an acknowledgement of a long time "friend". As noted above this is an example of how the animals who traditionally live in this area are also important within our lives as Nganguleros! La Tierra va trembla! Our dogs are not pets! Some people have problems understanding this, but they do not come into our beds, we do not feed them from our plates. They are here because certain Misterios like to have them around. This perro holds important energies during Ceremony and protects the Land! 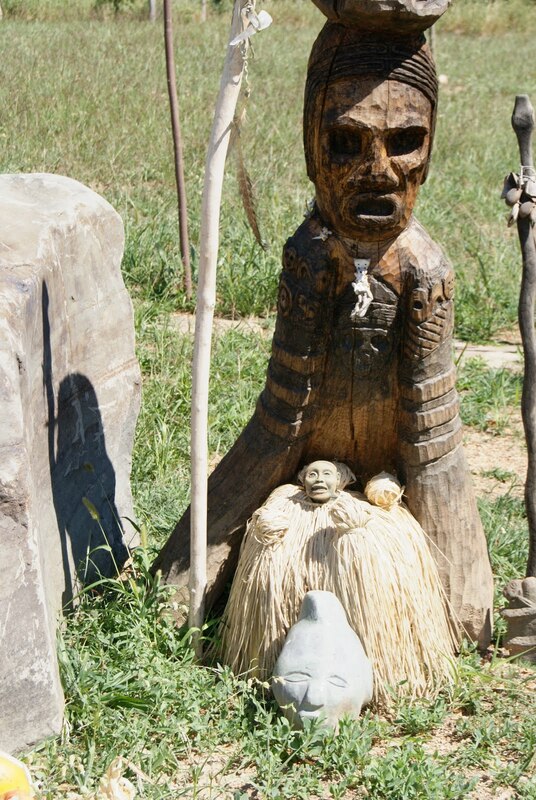 In fact all the domestic animals on the Land are there because Misterios and Ancestors want them there, they contribute to the energy and Spirit of the Munanso and Ceremonial Grounds! 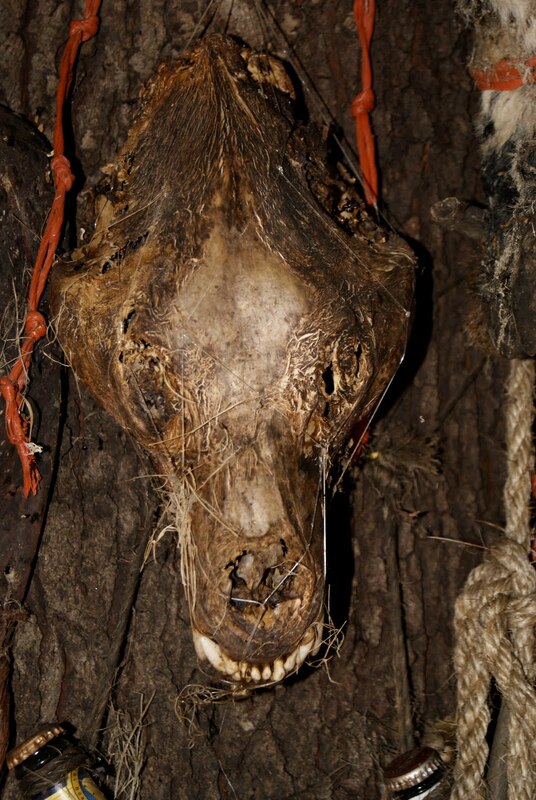 We have been blessed to be able to trace back to the specific ancestors who are associated with the various Animals. Here the paint stallion "Kasike" interrelates with Nsasi's Bull "Thunder from down and under!" 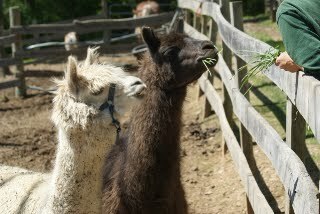 Here the male llama and female alpaca "Tobacco and Cohoba" come up to eat grass! Long before they arrived they arrived first in spirit through llama and alpaca bone flutes. Later the living animals arrived. They are sacred animals, closely associated with Panchamama (Atabey, Mother Earth) in South America. 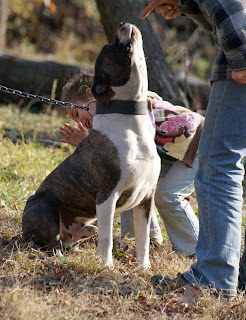 They are testaments to the trail linking Taino back to the Mother Culture of South America! The chickens are here for the practical reason that they lay eggs, however there is also a particular Ancestor who kept chickens and likes to have them around! The roosters of course play an important role in the Munanso! These bottles hold water from many different points, sacred springs, waterfalls, rivers, Oceans, Lagoons, lakes, ponds etc. 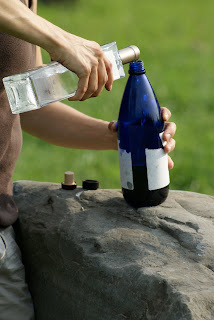 Whenever we go to a body of water we always carry empty bottles in order to collect water, we will seek out specific energies within the water to gather water at those points. A view of the storage closet which holds supplies... but not all the supplies which constantly overrun their space. And constantly require new storage solutions! Again we are fortunate to be stocked with items that are rare and can only be found by country-dwellers and we are able to find unusual sources of resources. Palos and bejucos (roots) leaning up against the back of Nsasi's Munanso. This space is currently being transformed into a workspace with a roof for the Ngangulero. The photo above and close up below show our 4 year old daughter's "Munanso" which we built for her after she began to create her own Munanso in the corner of the munanso clearing. 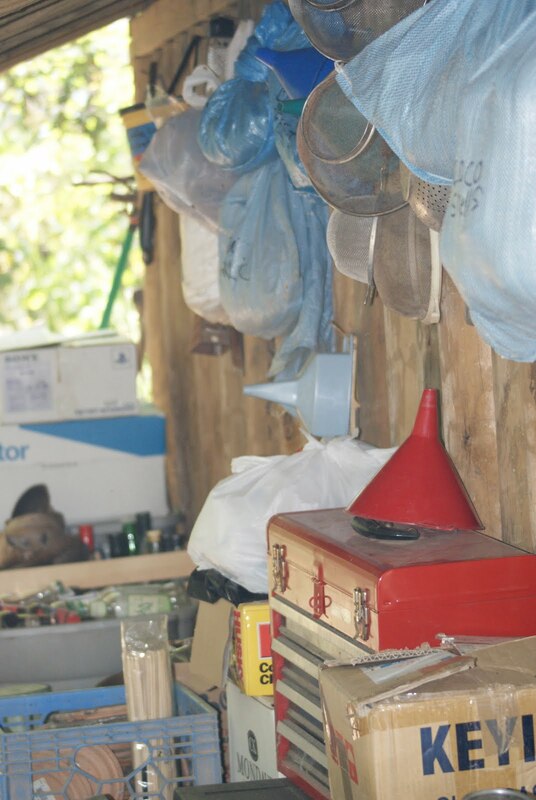 She gathered various palos and other items as well as gifts that she was given, and spends much time working in her Munanso. This has been a natural development that has come from her following around the Ngangulero and Ngangulera. We always ensure that her space is safe, she knows what she cannot touch or do, but within these boundaries she can do whatever she feels moved to do in the space. She also knows what plants around the land are poisonous and knows not to touch them. If she does not know about a certain plant, she always asks. This beautiful process far outweighs all the criticism, difficulties, and negativities that we have been bombarded by over the years. This child has declared herself who her Misterios are and works every day to bring more energy to that! As we say "the taste is in the pudding". And when her niece visited, she jumped right into the energy! She knows who each of the Palos are and is quick to correct anyone who ignorantly calls them something they are not! Inside Nsasi's Munanso, a tree grows right through the ceiling! Although challenging from an architectural viewpoint for the amature architect, it brings an excellent energy and spirit to the space! The outside of the women's Munanso is a cage full of "ring neck doves" whose cooing can be heard hundreds of yards away! The log veneer on the outside are boards cut from trees from the land. The rest is stucco upon which firmas can be painted! "Cucaracha" plants in the hanging baskets are bano plants, these ones miraculously grew back better than ever after being inadvertently frozen last winter! Two views inside the women's Munanso. Medicinal plants hang from the ceiling, these will later be ground up and put in jars for future use! At this point they are bringing an awesome smell the Munanso! All the feminine Misterios are honored in the Munanso. Firmas are painted on the walls and the spirit in here is awesome! The Munanso creates the feeling of being underwater when the door is closed as the only window is a small one with special glass that you cannot see directly through, which creates an effect with the light of being underwater. This also creates the perfect environment for drying the herbs without the sun bleaching them out. Again, if we go back to the title "not the Dark Side of Santeria", we would like to illuminate a point: There is nothing "bad, negative or evil" about what is taking place here. It is beautiful, spiritual and progressive! 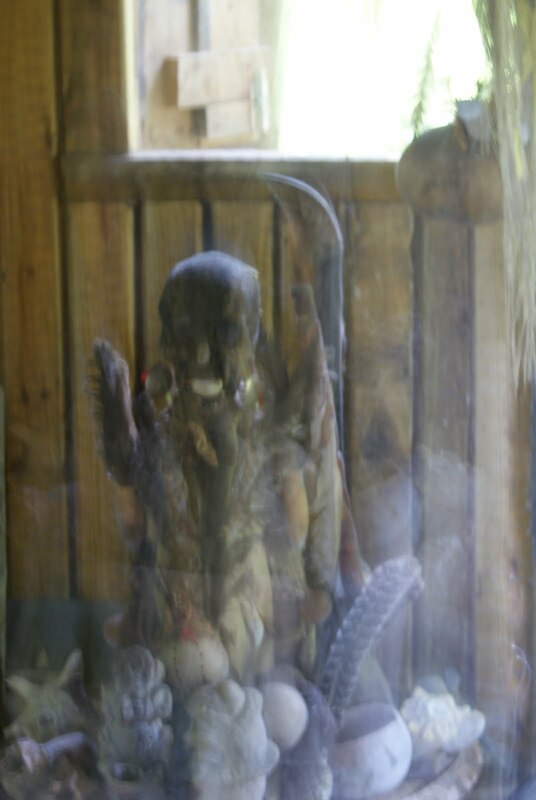 Below, from an Ancestral Honoring ceremony that took place, an Ancestral Brujo Mask is in the Cosmic Point of a particular Batey, representing the Cosmic Snake (DNA) of Creation! Two Taino Cemis, Opiel Guabiran and Guatauba Maquetaurie are up in a Prayer Circle that was created over the summer! This circle is located in a very open hill top area where the Cosmic bodies of the stars are very visible at night, as well as Sun and Moon! The Circle itself reaches out to all those circles of progression globally. The central Stone within the Circle is the Center of "Mundo sobre Mundo" and absorbs the Sun's energy during the day, releasing it at night! It is our way of connecting with and contributing to a global Spirit of Progression and Healing. 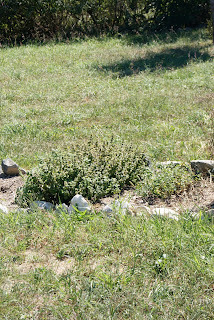 Below is the mound that connects from the Purification Lodge to the Ceremonial Fire. 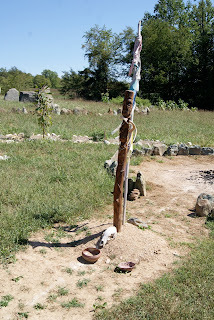 The Ancestral Baton pictured earlier in this article is planted on the mound and was involved in the Ancestral Honoring Ceremony that recently took place. 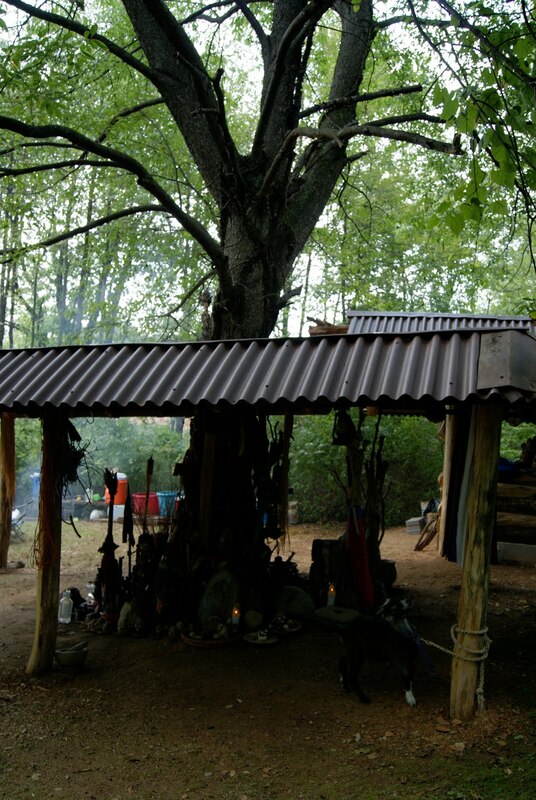 All around the Purification lodge is a garden bed in which many herbs grow, most perennial. 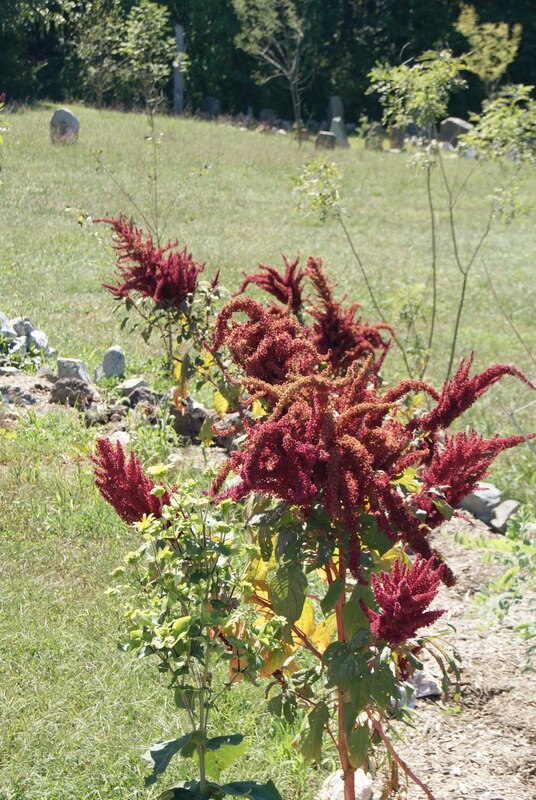 Below is the magenta amaranth, and a variety of sage which we use to smudge areas, including the Munanso, we bundle it and dry it for use all winter long. Below is oregano and lemon balm from the same garden, and the flower is a gladiolus which we interplant in the vegetable garden to enhance the beneficial insects in the garden and add color. It also gets used when we make a flower bano! More plantas, tobacco plants are seen in the background behind one of the Ancestral Trees on the Land and behind one of the Bateys. A close up of the tobacco shows the flower heads which produce millions of tobacco seeds! Even closer, the beauty of the plant can be seen, this is a powerful spirit that is essential within all banos! A row of sunflowers. The seeds attract many birds, and the flowers attract bees, these are also important in certain Trabajos!!! We also use them in Banos and as offerings. A close up of the sunflower shows the bumble bees who have gathered on it. 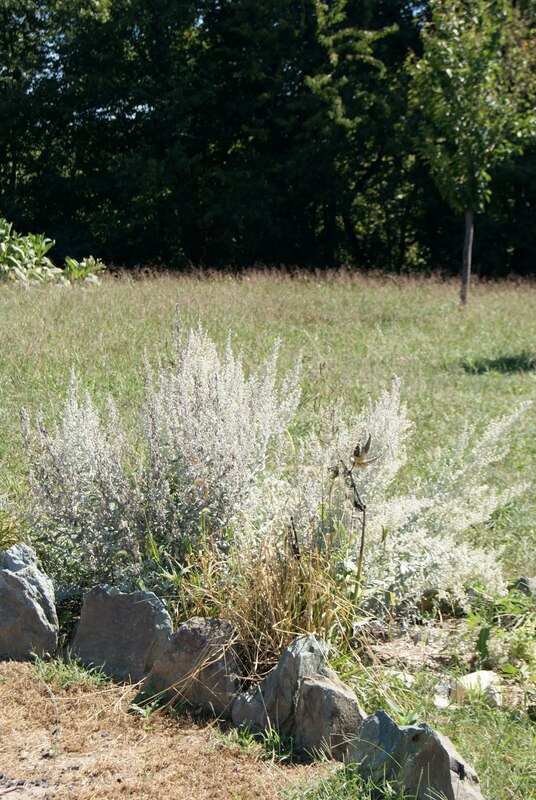 Another garden with flowers and medicinal herbs, including wild stalks of mullein. We also grow gourds for practical use and for spiritual purposes. These are birdhouse gourds. 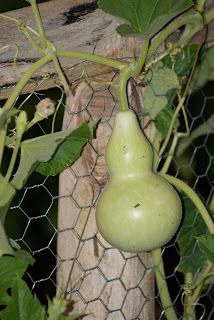 We also grow bowl gourds that are utilized in the Munanso. These are just some examples of how the work of the Munanso, and the work of the Ngangulero extends far beyond the confines of the Munanso itself. It extends to a direct interrelationship with many of the plants and materials required by the Spiritual work. By directly working with the growing and observing the character and expression of the plants, the Ngangulera gains additional insight and understanding which cannot be gained through the intellect alone or through handling only the harvested product. 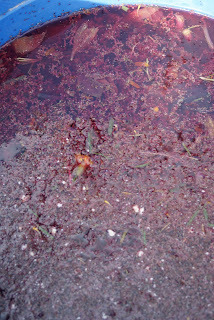 The next series of photos show a process of harvesting the wild Elderberries that are abundant on the Land and making a medicinal tincture from them. Elderberry stimulates the immune system, and we use it all the time. It is also available in stores at a significant price. Tinctures are basically made by using alcohol to extract the medicinal elements of the plant. We use high quality organic vodka but any clear alcohol like rum would work, we just are looking to create the best result possible. Traditionally Nganguleros knew the medicinal properties of EVERY Palo and Planta that they handled and put into the Fundamento. This is not always the case anymore, however this important pre-requisite can be re-established or reclaimed. Elderberry is a prolific shrub and every one of these little berries has the potential to grow a whole new shrub. 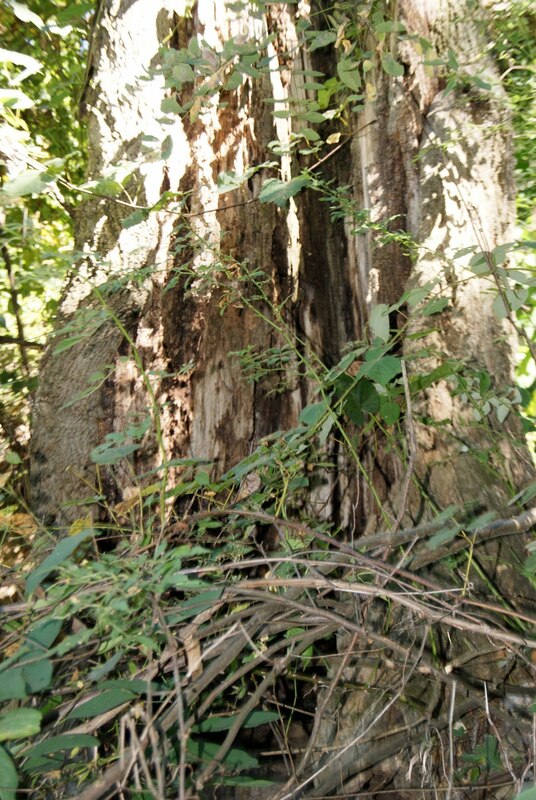 Elderberry is a native to this area, although this particular variety is an import that someone, who is now undoubtedly an Ancestor, brought to this area most likely because of its medicinal value. Paleros are known for their "Spiritual Work" in terms of working with those things that have the Spirit in conflict around an individual. Again, traditionally Palo was also a system of herbal medicine. This is an aspect of Palo (the Curandera aspect if you will) that is very important to this Munanso. We know that, especially at this time, the need for physical health and healing is reaching a point of desperation, and the need for individuals to empower their immune systems and the harmony and balance of their bodies is ESSENTIAL! The Elderberry also is used as a dye. Tinctures are the fresh or dried plant plus alcohol plus time! 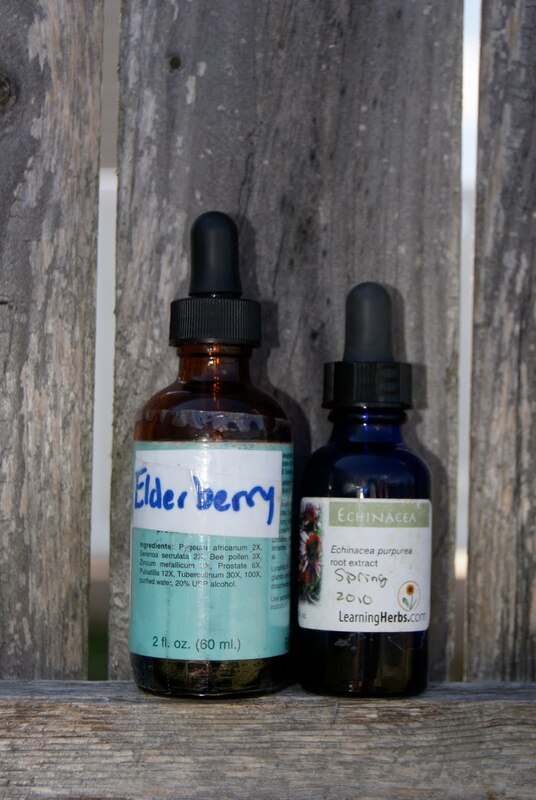 These are two tinctures, one is the Elderberry, the other is an echinacea tincture that we made. Both are active in our kitchen cabinet! Another Egun tree. We honor various Ancestors by planting Trees in their honor! This fundamento below has been instrumental in the spiritual tracking of Ancestral Trees which continue to impact the Living. Some of the case studies that this particular Fundamento was involved in will be shared in articles to follow. One case in particular is of special interest. 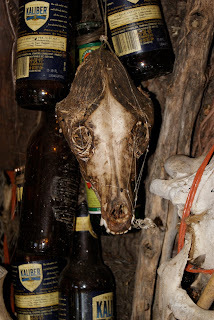 We will bring this forth to illustrate some of the other aspects that our Munanso works with, and in which the Ngangulero illuminates some powerful facts, and it becomes abundantly clear that Palo is NOT the 'dark side' of santeria. 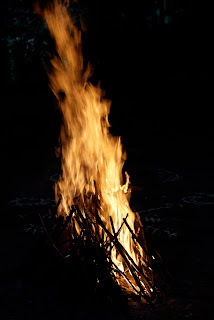 Below is a fire that the Ngangulero worked for a specific purpose. This particular fire burned over seven days. Back at the grill an offering for Egun is cooking! 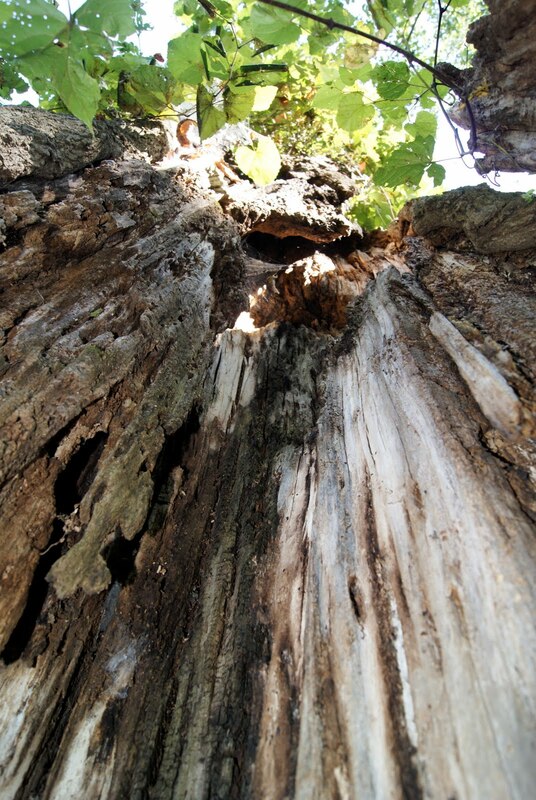 The Central Tree, where 360 degrees of space can be worked with. Below a "Sun Shower". One of the advantages of having a Munanso which is outdoors is that the weather cycles are felt much more strongly and we can bring Bilongos out to be refreshened or empowered by these types of rains. We also catch the water of this type of rain for future use. Again weather conditions are felt much more intimately than if we were indoors. The pigeons below, flying, again they are here for a specific Ancestor! They are also used spiritually on occasion, and could be eaten if the circumstances arose! One of the pigeon houses with sunflowers in the foreground. On this particular day three vultures were standing on the roofs of the pigeon houses, allowing us to take their photo. The vultures are always leaving us feathers. The bees are again here for a particular Misterio, as well as to pollenate the vegetables and fruit trees and to produce honey and wax. Working with the bees allows the Ngangulera to gain further insight into properties and expressions of them and the honey they produce. Reading or hearing about the bees can never substitute for experiencing them and their behaviors when happy or when feeling threatened. There is a certain buzzing they make when upset that penetrates one's mind and unsettles one profoundly. All the different expressions of the bees tell us about the Misterio that they 'belong' to. The women's Batey is within the forest adjacent to the Moon Circle Batey. 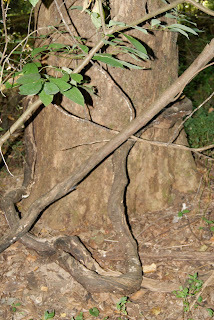 This is a area that the Ngangulera works with. Powerful trato occurs here, and things that only women can do. Because of the machismo derived from colonization, women's power is often misrepresented, and women's cycles are even demonized. This is far from the truth, women's Moon Cycle is a powerful force for manifestation and removal of obstacles. Moon Cycle is a time of powerful connection to Ancestors and Powerful Trabajos! 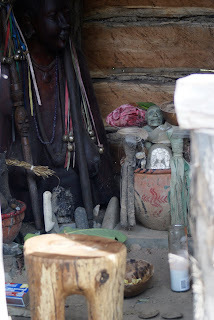 This is a space that all the Yayis from the Munanso can utilize under the guidance of the Ngangulera for any issues that they feel the need to work with in this way. 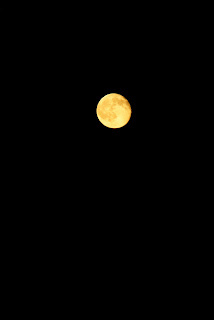 A Ngangulero can only recommend that a woman seek out the space to work with the Moon Cycle and the Moon Misterios, therefore it is essential that Nganguleras take the initiative to create and maintain these spaces! 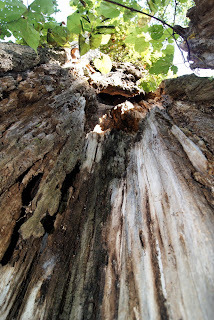 Below we approach a very powerful, very old Palo upon the Land. It marks one of the corners and could be two hundred years old, definitely well over 100 years old! When one is collecting Palos as a Ngangulero, it is important to know where they are coming from. Botanicas sell Palos however we do not know how they are harvested or what trees they are coming from, where those trees are located (they could be coming from Central Park or Pelham Bay Park), what energies are near them, and so on. 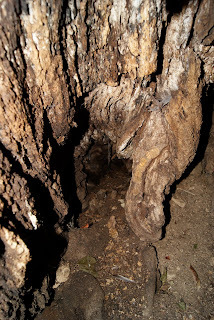 Here we know that this Palo is very old, very powerful, located next to a natural spring. 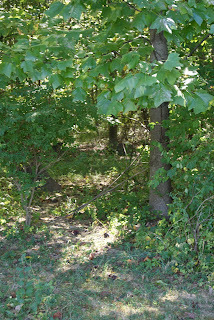 We know that the day we went down and took these photos that the elusive wild Turkey was calling and came very close to the tree. 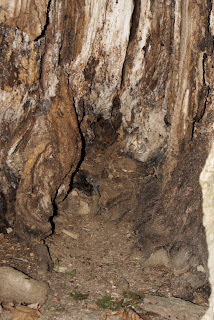 When we collect soil from this tree we know that it is soil that has received offering from various Ceremonies, we know that animals walk over it, defecate on it, that shells of nuts dropped by chipmunks and squirrels become incorporated into it. 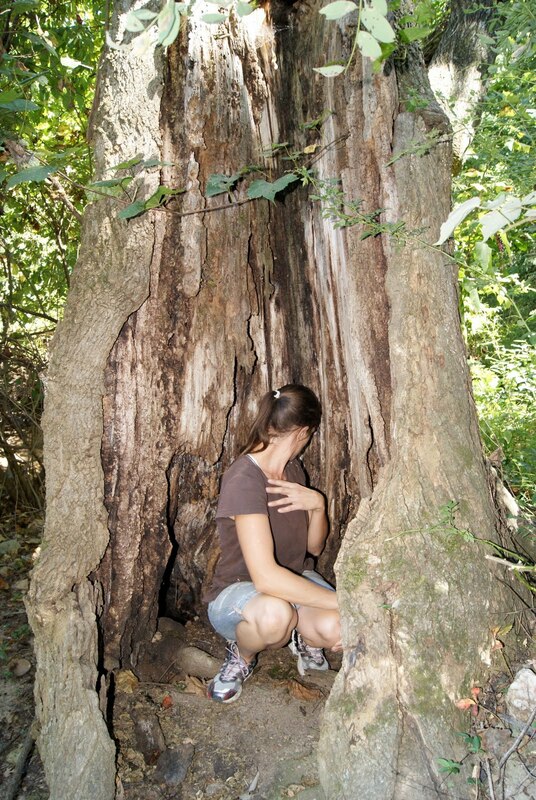 This tree is large enough for us to actually place a Fundamento within it for a particular process or during a process of its awakening. We are able to have an individual who is involved in Ceremony sit right within the tree to meditate. Inside the tree Misterios look down on whoever is standing below. 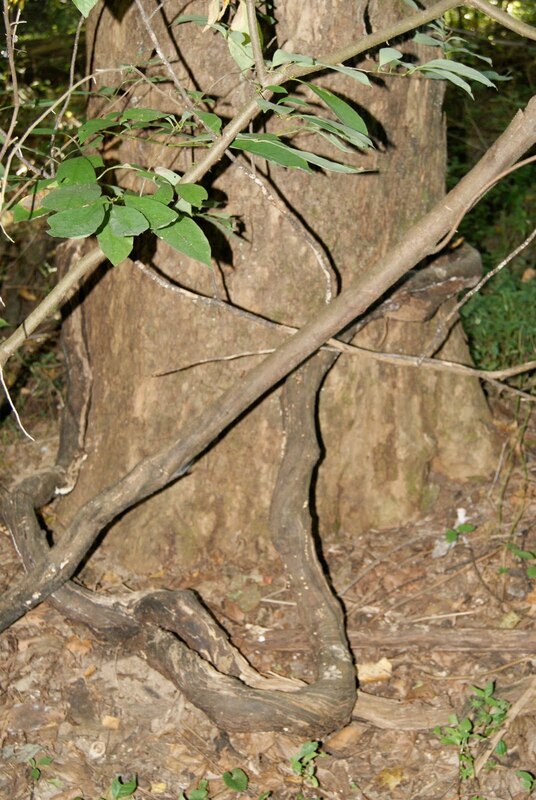 Small pieces of the tree itself can be gently broken off for use within the Munanso. In another part of the Land there is an old road which used to be a road through the area. Many years ago the mail route ran right through here, the mailman and his horse would cart the mail down this rough road. On one occasion four old men came down our drive looking to see if they could drive all the way through down the old road. The indentation from the road is still clearly visible, and we utilize it to gather firewood. Again soil from this road has a powerful history to it. This road also was the road along which the community of Nazarites lived when this area was a Spiritual Community of Black Nazarites. Much of the Land is currently left in its "wild" state. 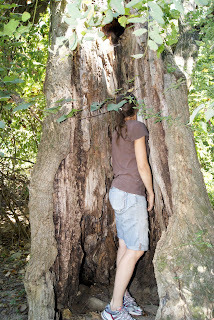 Many beautiful trees grow here and we explore the area when we are in search of specific things. This area also includes many natural springs, yellow and gray clays and a seasonal stream. 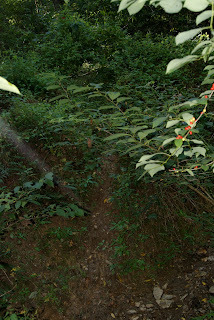 Deer live in here and have made deer trails all over. Below, the banks of the seasonal stream are mostly clay, we gather this for use in the Munanso. Additionally as Nganguleros we are always on the look out for unusual soils and stones in our everyday movement outside the Land. We have collected white clay, volcanic stones, yellow, red, and gray clays, sands, soils from the roots of fallen trees, and much more. The Ngangulero never stops being who she/he is and is always watchful for what the Misterios bring to him/her. 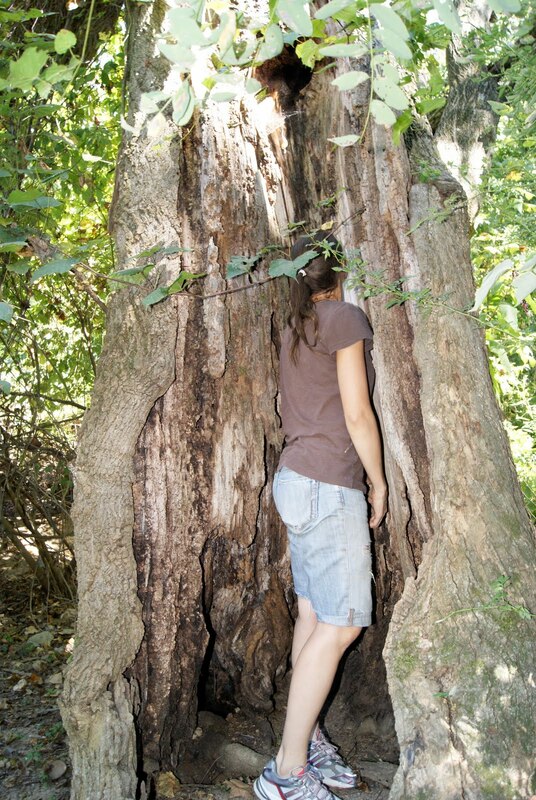 By leaving the forest undisturbed in this area we allow the wildlife to have a refuge and we also allow the trees to continue to give us oxygen! During the summer it looks like a jungle with its abundant growth, during the winter it transforms and the Palos are all visible in their skeletal expressions. The tree below has four trunks coming from one root! When we gather a palo from this tree, we know this about it and we know why we are gathering the Palo from a tree with this type of expression. This is an aspect of Palo that has been greatly disturbed through the movement of its practitioners to urban settings. In the view of this Munanso it is vital that we, Nganguleros, find a way to reclaim our relationships with the "spirits" that we use in our Spiritual Tradition. 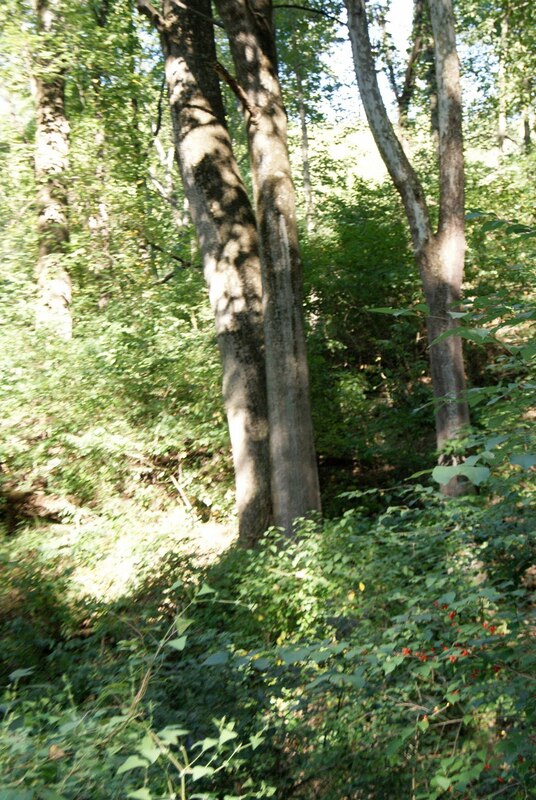 This forest is at least 16 acres. We have places in here where a Yayi or Tata in ceremony could sit undisturbed for hours, even days. There are NO roads or houses visible at all, you can hear planes, and distant machinery but nothing close by. 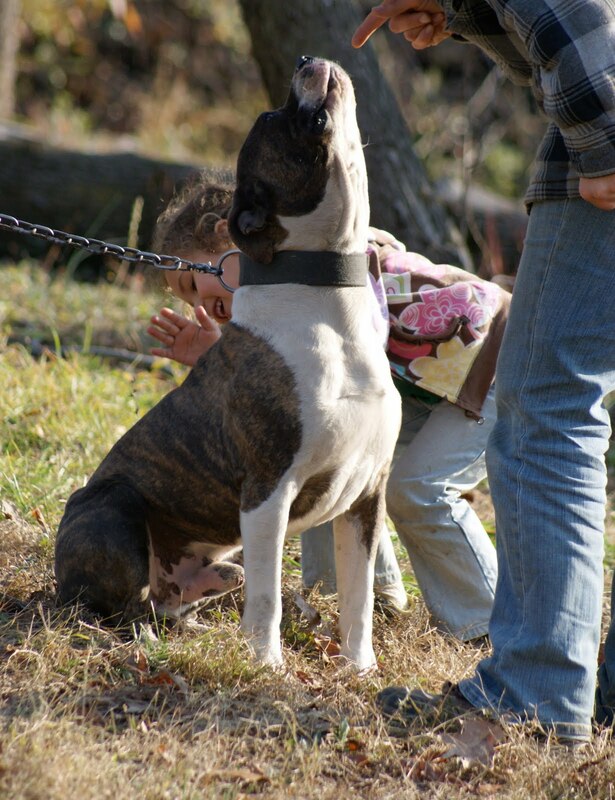 You hear turkey, birds, squirrels, deers, at night raccoons, foxes fighting, owls, skunks and more. The terrain is very hilly and has rocky outcrops which are awesome, all kinds of native plants grow, including a wild mint which has a phenomenal smell! Wild blueberries also grow, although you have to be alert to pick the ripe berries as they come and go quietly. Heavy Manigua makes movement difficult in some area. 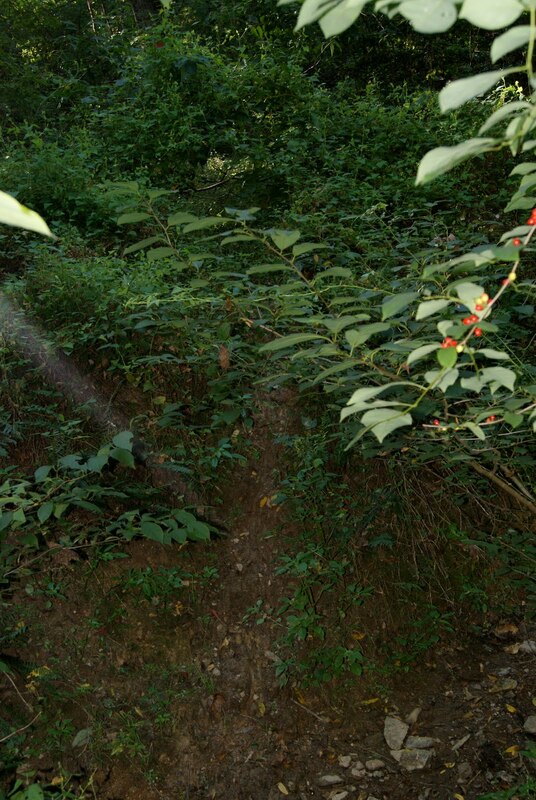 Generally we find deer trails to follow. 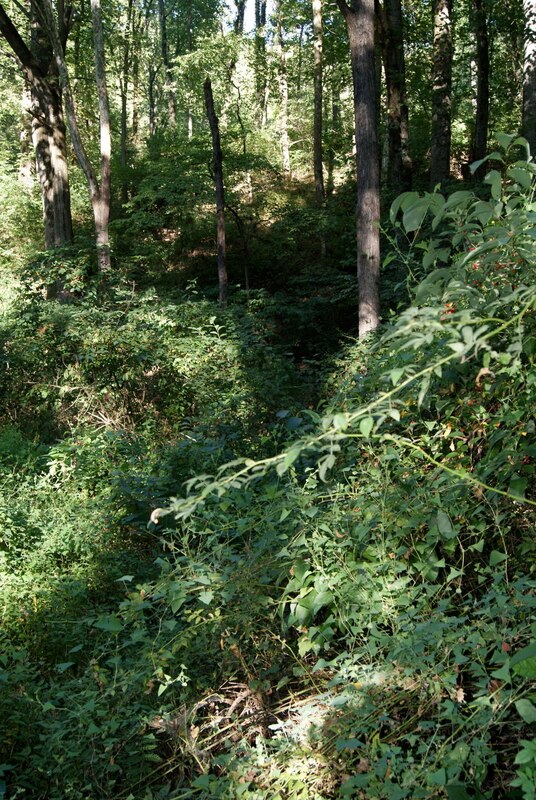 During the summer it is virtually impossible to get through the forest without a machete. 100 years ago a Community of Africans who were Nazarites lived upon the Land. There was 19 families and a Lodge. They had a large fruit orchard and the wild fruit trees are still found here today. This Campo Santo is their burial grounds. Many graves are unmarked, Burials in here extend from about late 1800s to the present. It is very quiet, with forest all around. We make sure that we honor the Egun in here and acknowledge them. One of the houses of the people of this community was right on the Ceremonial Grounds near the Women's area. 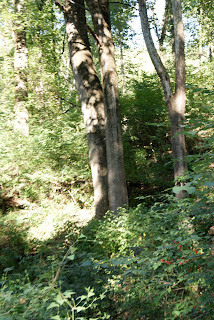 Another was deep in the forest that we were just describing. 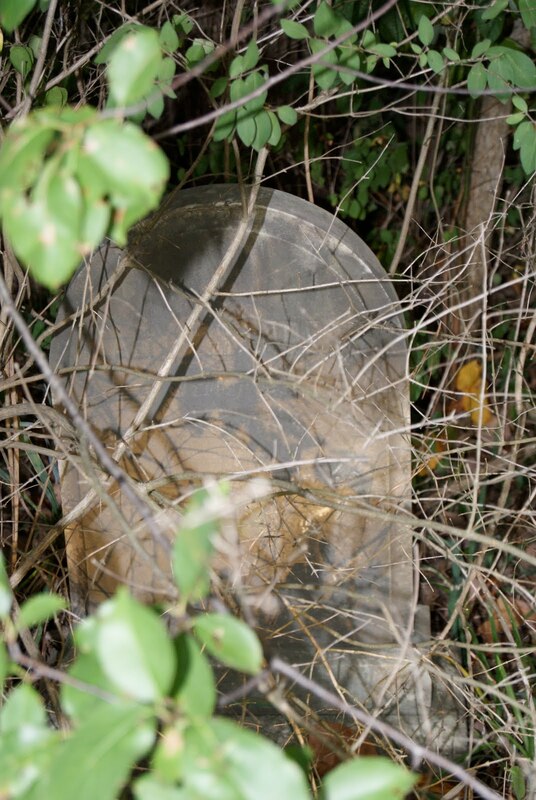 Some of the headstones are almost totally obscured by the forest or trees. 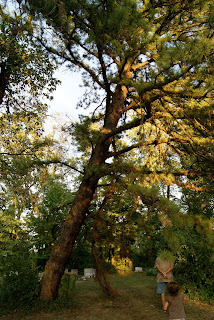 The Campo Santo has many native pines in it (Loblolly Pines). Here you can see us entering the Campo Santo with our daughter following right behind, learning all the time! She was the one who pointed out to us some tombs that were in the forest which we did not see. She also found Vulture feathers! Palo is about LIFE and DEATH and that which sustains both! It is about the processes of creation and the processes of decay. It is about the raw elements which give rise to the complexity of materials we interrelate with on a daily basis. It is encased within the world of the Ancestors which nourish the process of Spiritual Evolution and Material Manifestation! Palo is about Solutions! It is about the Mpungos that are the Spiritual Forces behind the manifestation of life. It is about the cycle of the Seasons, times of drought, times of abundance and it is about the development of the Consciousness of the Ngangulero and Ngangulera concerning the phenomenon of Life and Death and the trail to coming into balance and creativity within this phenomenon. It is about the understanding of the Life Force that runs in the bloodstream of Life! If minga is absent within the practice of Palo, it is an illusion that leads to no conclusions and that entraps one in the fantasies of hollywood spirituality that leads to the dungeons of torments that exist in the ignorance of the mental body's inability to break the chains of mediocrity. The blood that gathers in the primordial placenta of the womb and then flows externally is the seed of understanding the foundation and breath and life force of Palo inside of the Darkness of Creation that is Life and that is Creativity. It is essential to understand the magical forces and ingredients in each Palo that is put within a Fundamento or within each Nkisi that comes alive from the trees of the forest that comes looking for the ingredients of the blood force to thrive for the benefit of the Ngangulero or for the villages or community of the Ngangulero.